Fabien's Autumn mode harmonizes the element of Metal, which empowers the lungs in Chinese medicine. We feel the Light of Autumn. We open to Compassion. The world becomes the Lightness of Being. Reverse side of the wind sail can be engraved with up to 50 characters of your thoughts, feelings, names, and dates. ONE HUNDRED (100) CHARACTERS MAXIMUM, Including Spaces & Punctuation. Musician/composer, acupuncturist Fabien Maman, one of the world's leading experts on vibrational sound therapy, developed a series of Seasonal Harmonizing Concerts to bring human beings, nature and the cosmos into healing harmony. He has been playing these concerts around the world for more than 30 years. Seasonal Harmonizing Chimes (1 for each season), using Fabien Maman's modes, so that you can have a mini-concert in your own backyard that tunes with the energies of each season. Their harmonic overtones are beautiful! 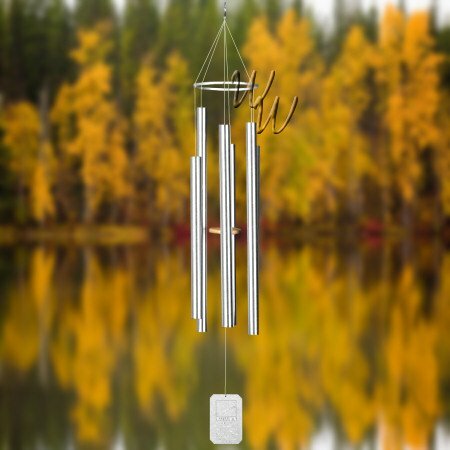 This chime, like other Grace Note chimes, is made from harmonically-tuned aluminum, and features a recycled composite wood striker. A personalized engraved wind sail can be added if desired. This product carries a 10-year guarantee against breakage.